SOME LIKE IT ESSEX: "iWANT TO RIDE MY BICYCLE"
"iWANT TO RIDE MY BICYCLE"
YP and I managed to make treasures from other peoples rubbish by acquiring freebie bikes. Not in the ghetto way of stealing but just bikes that were thrown out in peoples gardens or taking up room in sheds! Our bikes are opposite to our personas: YP has a green with pink handles boy racer bike, whereas I have a white Raleigh Caprice Lady bike! Now I used to ride loads up until I was about 15, but since then I haven't rode at all so thought it would be fun to investigate london by bike and get free fun exercise. Well to be honest I want body to rival Beyonce and I'm too cheap and lazy to join a gym! ROUTE: Essex to Camden (Obviously by train) then Camden to Hackney. Hackney to The City. City to the Southbank. Southbank to Liverpool street. Train home! OMG it was so rough on my bum. 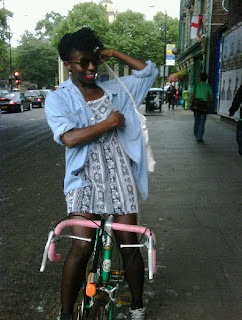 And the adrenaline from almost dying several times made me giggle and laugh uncontrollably to the fact I couldn't ride. 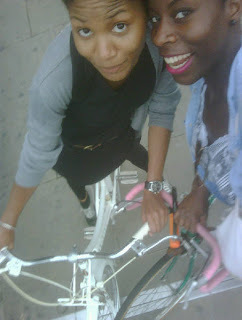 Highlights: Riding over London Bridge in the sunshine, bagels on brick lane and coming home alive.